Tastes just like your favourite dip, spinach artichoke chicken casserole is an easy dinner recipe that comes together quickly! Add chicken breasts, chilli flakes, minced garlic and 1/2 teaspoon salt to a baking dish. Rub the spices on both sides of the chicken breasts and arrange them side by side in the baking pan. Set aside to marinate. Preheat oven to 400F. Melt butter in a pan and add flour. On a medium flame, saute the flour for a minute and slowly add milk while whisking continuously to ensure no lumps form. Keep whisking till the sauce comes to a simmer and starts to thicken. Whisk in the cream cheese and set aside. Squeeze the defrosted spinach to remove any extra water. Add spinach, artichoke hearts and the remaining 1/2 teaspoon salt to a bowl and mix well. 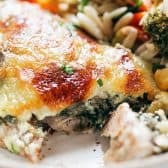 Spread the spinach artichoke mixture on top of each chicken breast, pour the sauce all over and bake for 35 minutes. At the 25 minute mark, sprinkle mozzarella over the chicken and place it back in the oven for the next 10 minutes. Serve hot.